« Slipped right through my fingers…. You’d be hard pressed to find a more versatile combination. I’ve eaten a plateful just for dinner. I’ve mixed them into a creamy orzo for a fabulous comfort food dish. I use it as a side for roast pork. I’ve also stirred it into a cream sauce with any other veggies for the best chicken pot pie ever to appear in my kitchen. Oh, and it’s actually good cold, for a quick bite, before you rush out the door into the shopping madness. Make a big tray of this. The prep time is small, the reward huge. It will hang out in your refrigerator for a week, just fine. You won’t be sorry. 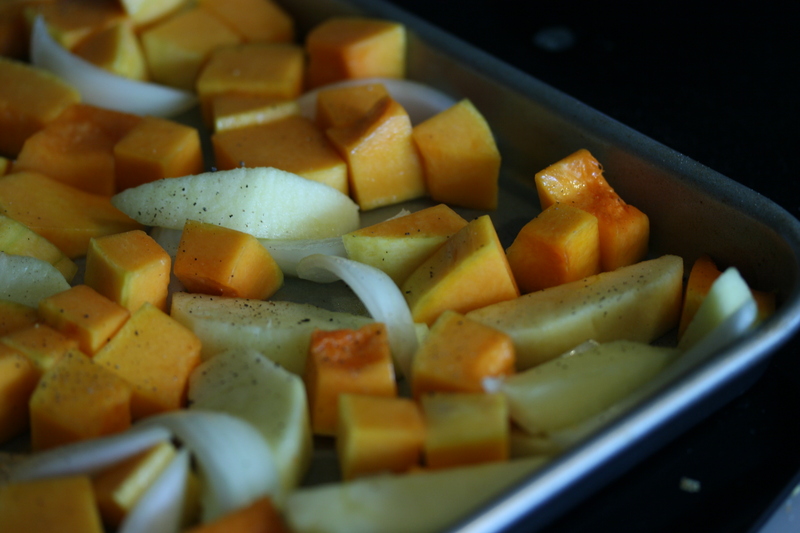 On a large baking sheet, mix squash, apples and onions together. Drizzle olive oil, sprinkle salt and pepper, and mix with clean hands until all are coated with oil and salt and pepper. Place in center of oven and roast for 30 minutes. Check for doneness, the apples should be soft but holding their shape, the squash should be browned and tender and the onions translucent and starting to caramelize. Increase time as needed, checking at 5 to 10 minute intervals. I used a large baking sheet and it took almost 50 minutes. Try not to crowd pieces. Here are your variables: As always, depending on your oven, time may need to be increased. I find that if the apples are not very juicy you might want to give them a light coat of oil before you mix with the rest of the ingredients and oil. Salt and pepper is to your taste. Of course, add herbs as you like, I like to add the herbs as I use them in different dishes. Taste and reseason as needed. I make variations of this all the time, first for our vegan guests but it was such a hit, I make it just regularly. I also like adding yams or sweet potatoes, beets (cooked separately so they don’t miscolor the winter squashes) and some kind of green, usually asparagus, to round it out. I never thought of apples! Good idea. I’m glad you’re posting again! I missed it! Thanks Kris! 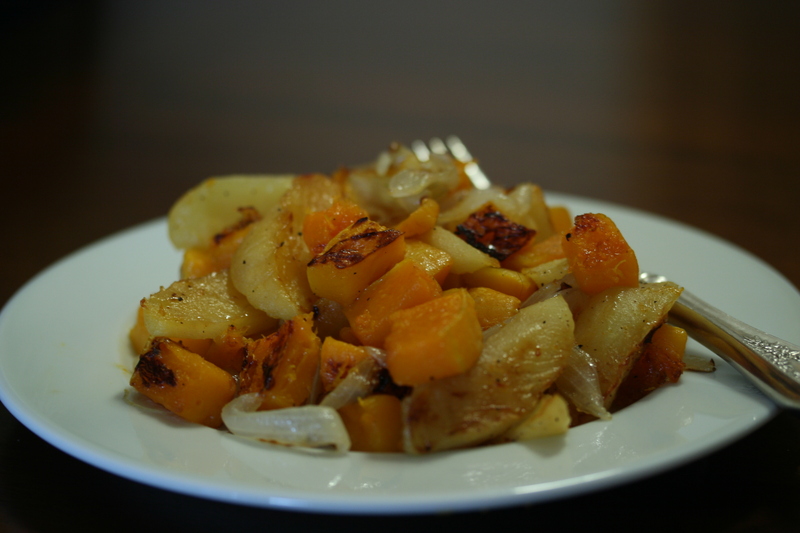 I have many variations as well, I love roasted veggies. This combo is one that comes up over and over again. I hope you enjoy it when you try it! Oh my this looks heavenly, I do something with roasted sweet potatoes and apples and those are quite good together, but this quite honestly looks so much more tasty! This is going to be served out of my kitchen very soon. It is in my oven now roasting away……… Yum. I used a purple onion for some color contrast. 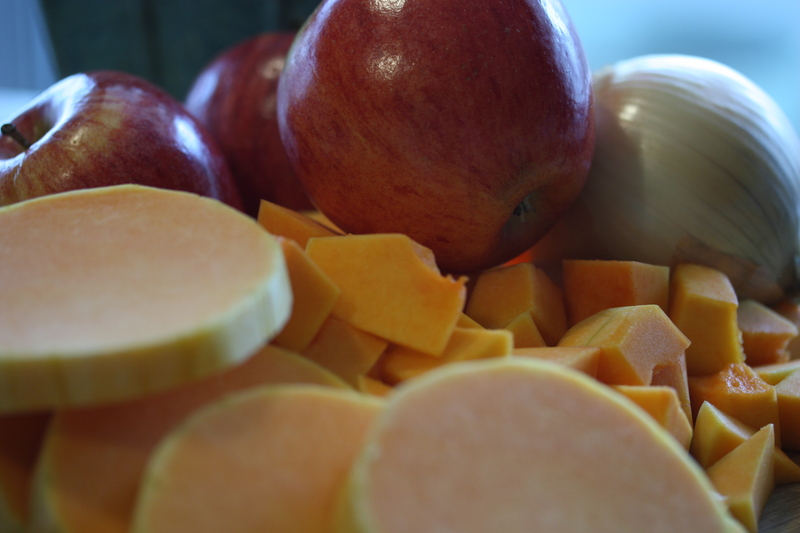 Also, purple onion has a natural sweetness to it. Thanks!